Richmond Hill is located less than 30 minutes from the city of Toronto, in Southern Ontario, which makes it a great place to live and run a business. With easy highway access to the major city below, this district of just over 180,000 people is a thriving part of the Greater Toronto Area (GTA). Whether your have a broken refrigerator or a leaking dishwasher, and you live in Richmond Hill, our repair technicians are a phone call away. Regardless of the time or day, we assure you that your repair needs are our priority! It’s not just refrigerator, dishwasher and oven/stove problems that we tackled – although fixing your home or business cooking appliances is a major part of our business – we also repair dryers and washers so your laundry won’t keep piling up! Highly skilled, fully certified and insured, our Richmond hill Appliance Repair technicians come to your home or business fully equipped with most frequently used replacement parts on hand. When necessary, we can step out and buy a new part right near you, if what we have won’t work! We know that our customers major concerns are, often, “will we know the brand or model of appliance” and more importantly “can we fix something that is very old?” The answer is, of course, yes! 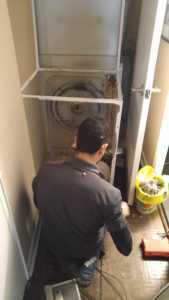 We service a wide range of models and brands of all types of appliances. And age is not a problem! We make it our priority to fix whatever is broken, on-site, and if it can not be done we will always offer a solution that will work for you. Our technicians are trained to provide the best possible alternative to on-site repair and will never charge unnecessary costs! So whatever is wrong, whatever age and/or whatever part is broken, your only concern is to give us a call – leave the rest to us! See a sign that something might be wrong? Call! Noticed that your clothes come out of the dryer still wet or your wash cycle stops half way through? Call us– don’t wait and get frustrated about not washed through or wet clothes. And because we have a 24 hour phone line, there is absolutely no need to wait to set up an appointment. Whatever is convenient for you is convenient for us! Cost is also sometimes a factor so we want you to know that all our fees are completely transparent. You will be charged for a set amount, regardless of how long or how complicated the job actually is. If there are any unexpected delays or the problem is worse than we initially thought, further discussion can be had with our technician. All costs will be approved by you, anyway, so there’s nothing to worry about. Don’t let a broken appliance disrupt your day – don’t let that great meal you had planned get sidelined because your oven won’t turn on! We know the frustration so believe us when we say that all it takes is a call and we will be at your door!